BEND, Ore. - A Bend, Oregon, woman was recovering in the hospital Wednesday, two days after authorities said she apparently shot and killed her disabled 7-year-old son in their southwest Bend home, then took an overdose of pills in an apparent suicide attempt, KTVZ-TV reported. Deschutes County District Attorney John Hummel told KTVZ-TV on Wednesday that Tashina Aleine Jordan, 28, tried to take her own life by a drug overdose. Hummel said she took a combination of pills, but would not elaborate on what kind or how many. KTVZ-TV also asked police Lt. Clint Burleigh what type of gun was used and whether it was owned or purchased by Jordan. Burleigh said he would reach out to investigators, but added that it was still an active criminal investigation. Hummel said he wouldn't comment on the type of firearm or what was in the notes that police said Jordan left behind. Bend police and fire medics were called to the 20000 block of Mt. Hope Lane around 5:45 p.m. Monday on a report of a woman found unconscious in the home, Burleigh said. A family member had found Jordan unresponsive in the house and called Deschutes County 911, he said. The family member and first responders performed lifesaving efforts on Jordan in the home and she was rushed to St. Charles Bend, where Burleigh said in a news release that "she is currently suffering from a life-threatening condition." Police and medics also found Jordan's 7-year-old son in the home with a fatal gunshot wound, Burleigh said. "Evidence present, to include notes left at the scene, led the investigators to believe that Tashina is a suspect in the shooting of her child," the lieutenant said, adding that the woman "attempted suicide," leading to her hospitalization. Burleigh said the investigation is continuing with help from their partners with the Oregon State Police Crime Lab, the Deschutes County District Attorney’s Office, the Redmond Police Department and the state Department of Human Services. Those who knew the mother and son reflected on the tragic turn of events. Faythe and Bill Cody said they want the neighborhood to be a place where people can lean on each other for support if they need it. "I really feel like I need to go and get to know my neighbors." Faythe Cody said. "You know, because I can pray with them. And you know, I have been on some tough times myself and I can offer true hope." Others said they were heartbroken by the news and wished they could have done something to help. In the summer of 2016, KTVZ-TV interviewed Tashina Jordan about a successful viewer effort to raise enough money in a day to get her then-4-year-old son, Mason, his own $4,000 specialized bike. with custom features to let the boy ride it by himself. That occurred after the boy wasn't chosen by a program that provides bikes for disabled children. Earlier that year, she told KTVZ-TV that when her son was only 5 weeks old, he had heart failure and two massive brain bleeds. After he went into a coma, they put him on life support. "I told the doctors to keep going, and shortly after that Mason came out of his coma and was able to have his heart surgery," Jordan said at the time. " I was told that he was never going to walk or do anything, and here we are now." In August 2016, Jordan said Mason's new bike will "give him the ability to be a child -- I mean, every child needs a bike. It'll give him so much independence." Mason had cerebral palsy and hydrocephalus, according to his page on the Sparrows Club website, noting that Miller Elementary “adopted” him in February 2017. The organization pairs children in need with schools where students perform community service to raise funds to help pay for expenses and other needs. A GoFundMe page to assist the boy's grandmother with funeral and related expenses has been set up by the Central Oregon Disability Support Network. Executive director Dianna Hansen said Tashina Jordan had served on their board of directors and the family was part of the network for many years. Hansen said Jordan loved and cared for her son. "He was amazing, funny, happy boy," she said Wednesday. "He was very curious about things. He loved his momma." 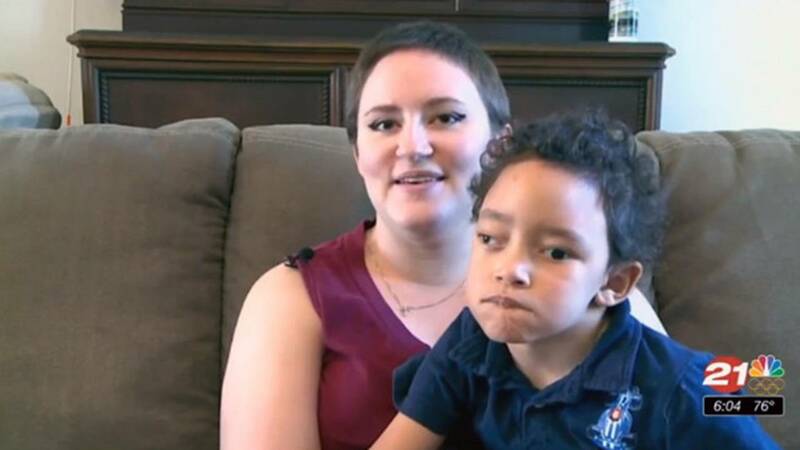 Stephanie Hunter, board chair for CODSN, told KTVZ-TV all the mothers would discuss both the good times and their struggles of raising a child with disabilities. "We're a group of parents that get together. There's a lot," Hunter said. "Much more joy and success than looking at these things in the community that are growing. But there's definitely those periods of time when we share the hard stuff with each other. Every single one of us have had those moments, and Tashina as well."